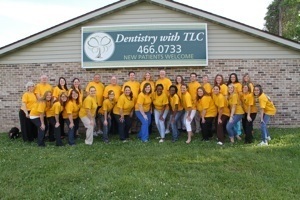 When Dr. Smith and Travis Smith purchased Dentistry With TLC in 2007 they decided to create a community service day to provide free dentistry for the less fortunate in our area. "God has blessed our lives in so many ways and we wanted to use this day to give thanks for those blessings while reaching out to help people in our area", said Dr. Smith. When they presented this idea to the staff of Dentistry With TLC, they were met with overwhelming support. Over the course of the next 10 years, the staff of Dentistry with TLC willingly gave up a day of regular pay each year to volunteer their time and expertise to provide free cleanings, fillings and extractions for over 1000 patients totaling over $200,000! Helped by family members of Dr. Smith and employees’ families each Dentistry With a Heart Day has been a huge success! Dentistry With a Heart Day has had countless volunteers, over a dozen doctors and even special guests over the years, including but not limited to: Kenny Battle and Larry Smith, former men’s basketball players from the University of Illinois. The reason for Dentistry With a Heart Day, of course, is the people Dr. Smith and staff get to serve. Dr. Smith explains that the patients who are served on Dentistry With a Heart Day are not regular patients of the practice. “My staff and I have never met most of the patients here. We simply open our doors and serve the first 80 patients who arrive, no strings attached.” Patients reported finding out about the event from many different sources including local newspapers, radio stations, church bulletins, internet, community service organizations and word-of-mouth. "I love you all! Thank you so much for helping me! Everyone at Dentistry With TLC was very gentle and so nice to me today. I’ve been having several problems lately because my car has been breaking down and I’ve had to miss work. It’s wonderful to have my tooth extracted today for free and not have to worry about it anymore." "God bless Dentistry With TLC for all your kindness and help. Everything you do to help people like me in financial hardship takes a great burden off of our lives. My husband lost his job of 20 years and I we just couldn’t afford to get my filling done without Dentistry With A Heart Day. This is a wonderful day, everyone here has been so nice and friendly." "THANK YOU ALL!! Thank you for helping me when I have nothing. Dentistry With TLC is a great place with great people. My wife and I have no income and I really needed an extraction. Today I got my tooth extracted for free. Thank you." "My experience at Dentistry With TLC today was wonderful! I was able to get my teeth cleaned for free and my hygienist did a great job. Thank you so much to everyone at Dentistry With TLC for offering Dentistry With A Heart Day." "Dentistry With A Heart Day has been a blessing to me because my tooth has been causing me pain. I’ve recently had back surgery and just couldn’t afford to have an extraction too. This has been a wonderful experience."